For other uses of "Alesso", see Alesso (disambiguation). 1.3 2016—present: "Let Me Go", "Is That For Me" and "Remedy"
Lindblad was born in Stockholm, and is of Swedish and Italian descent. He started playing piano at age 7, but became interested in Electronic Dance Music when he was 16. He first gained recognition with the release of his Alesso EP in 2010. In early 2011, Sebastian Ingrosso of Swedish House Mafia contacted Alesso and asked if he wanted to work together. Ingrosso introduced him to DJing and helped him with the production of tracks. Since that time, Ingrosso has acted as a mentor for Alesso, who referred to the elder Swede as a "big brother." Despite having learned to DJ in 2011, Alesso made his debut on DJ Magazine's list of the top 100 DJs at number 70 in that same year. One of the first songs Alesso produced with Sebastian Ingrosso was a 2011 track named "Calling" that reached number 2 on the Beatport charts. The song would later be renamed "Calling (Lose My Mind)" with an additional feature from Ryan Tedder. Alesso's 2011 remix of "Pressure" by Nadia Ali premiered at the #1 spot on The Hype Machine and was one of the most played EDM songs of 2011. From that point on, his popularity continued to rise. MTV named him one of the "EDM Rookies to Watch in 2012", and he recorded a BBC Radio 1 Essential Mix in March 2012. He played for a crowd of 60,000 at Creamfields, and accompanied Madonna on her MDNA World Tour at select European shows. By the end of 2012, Alesso had released another original mix called "Years" featuring Matthew Koma that performed well in the United Kingdom. He was ranked 20th on the list of the top 100 DJs of 2012 by DJ Magazine. Alesso playing at Ushuaïa nightclub, Ibiza in 2013. By 2013, Alesso had played at music festivals like Coachella, Electric Daisy Carnival, Ultra Music Festival, and Tomorrowland. He released a remix of "If I Lose Myself" by OneRepublic that was nominated for Grammy and garnered almost a million listens on SoundCloud in a relatively short time. In a collaboration with Calvin Harris and Hurts, Alesso released "Under Control" which racked up 88 million views. In 2013, he achieved his highest ranking on the list of the top 100 DJs at number 13. In July 2014, Alesso signed with Def Jam Recordings, becoming only the second EDM producer to sign with the label (after Afrojack). He debuted a new track called "Tear the Roof Up", which was named a "Future Exclusive" by Zane Lowe. The music video for "Tear The Roof Up" was released exclusively through SnapChat in September 2014. He embarked on his "Heroes Tour", named after his single "Heroes (We Could Be)" featuring Tove Lo. During the tour, Alesso teamed up with Chime for Change, a global charity that seeks to "improve the lives of women around the world." Alesso's involvement with the charity has raised over $50,000 as of October 2014. His debut studio album was originally set to be released in the first quarter of 2015, but was later released on 22 May 2015. It includes both "Heroes (We Could Be)" and "Tear the Roof Up". The single "Heroes (We Could Be)" was officially released on December 15, 2014. His new single, titled "Cool" and featuring Roy English, premiered on February 13, 2015, on BBC Radio 1. The track, which samples Kylie Minogue's "Get Outta My Way", was officially released in Europe on 16 February 2015 and in North America on 17 February 2015. 2016—present: "Let Me Go", "Is That For Me" and "Remedy"
On 30 September 2016, his new version of "I Wanna Know" featuring Taiwanese singer Jolin Tsai was officially released. Alesso and Tsai closed International Music Summit with an discussion of what it takes to bridge the gap between East and West in electronic music. On 1 October 2016, Alesso and Tsai performed the single "I Wanna Know" and a remix version of Tsai's hit "Play" together at the Storm Music Festival in Shanghai. On 4 October 2016, it was announced that Alesso would be releasing a new version of the song "Years", collaborating with K-pop band Exo's member, Chen. The song was released on October 7 through SM Station. On 7 October 2016, Alesso premiered a new single, co-produced by Dillon Francis, called "Take My Breath Away" during Ultra Music Festival Taiwan. The single was later released on October 21, 2016. Alesso on the Tomorrowland 2016 Mainstage. On 8 September 2017, Hailee Steinfeld released her new song “Let Me Go” which is a collaboration between Alesso, Watt, and Florida Georgia Line. On 13 October 2017, Alesso released his new single “Is That for Me” which is a collaboration with Brazilian singer Anitta. 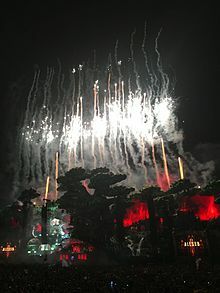 In 2018, Alesso went on his European Tour, highlighted by his closing performance at the Tomorrowland festival in Belgium. To celebrate the 10th anniversary of Electric Zoo later that year, Alesso is invited to be the headliner along with Tiesto. In August 2018, Alesso performed on ABC's Good Morning America's summer concert series where he debuted his new single, "Remedy". The concert was held in New York City's Central Park while Alesso was joined by singer Conor Maynard for the song's performance. Remedy reached number one on the US Dance Airplay chart. In October 2018, Alesso played three back to back sold out shows at the Hollywood Palladium in Los Angeles. Previously in the year he also performed shows in Brooklyn and San Francisco. He was also featured in Netflix's 'Vai Anitta' docu-series, which follows the life of fellow Shots Studios' superstar, Anitta (singer). An episode of the series focuses on their collaborative single "Is That for Me" and the subsequent music video shot in the Amazon jungle. Alesso finished off his year with a New Year's Eve performance at Miami's Fontainebleau Resort. He co-headlined the show with Colombian reggaeton star J Balvin where the two played at the venue's poolside. On January 29th, 2019 it was announced that Alesso will perform at the Indy 500 Snake Pit on May 26th, 2019, along with Skrillex, Illenium, and Chris Lake. Previous performers have included: Axwell ^ Ingrosso, deadmau5, Diplo, GRiZ, Zedd, Marshmello, Martin Garrix, Steve Aoki, Kaskade, Hardwell, Dillon Francis, and Zeds Dead. On February 22nd, 2019 he performed at the concert Venezuela Live Aid alongside influencers Lele Pons and Juanpa Zurita to help raise funds to fight Venezuelan humanitarian crisis. One of the heists in the popular video game Payday 2 has the players in an arena during an Alesso concert. The heist, named The Alesso Heist, was released on May 21, 2015. The music played during the concert are two of Alesso's own tracks, Payday and Profondo. Alesso is renowned for his methods of utilizing melodic vibes in his productions along which he also alternates between his rave oriented productions. Productions include "Clash" and "Tear the Roof Up" fit with his graveled rave style, while his other melodically rich counterpart include productions such as "Years" (featuring Matthew Koma), "Heroes" (featuring Tove Lo), and his collaboration with Dirty South and Ruben Haze – "City of Dreams". Some considered him to be the next generation in Swedish music after Swedish House Mafia. ^ a b c d e f McKay, Chris (May 3, 2013). "Interview with Alesso: 'I'm still working on my sound, I'm still evolving as an artist'". The Independent. Archived from the original on October 20, 2014. Retrieved September 28, 2014. ^ Kat Bein, "Alesso Teases Tropical 'Let Me Go' With Hailee Steinfeld, Florida Georgia Line: Listen", Billboard, 9/7/2017. Retrieved 18/10/2017. ^ "Swedish Star Alesso Signs With Shots Studios for Management: Exclusive". Billboard. Retrieved September 5, 2017. ^ a b c ""My album is coming in the first quarter of 2015..." – hmv.com talks to Alesso". HMV. November 18, 2014. Retrieved December 2, 2014. ^ a b Stewart, Adam (January 10, 2012). "EDM Rookies To Watch in 2012". MTV. Retrieved December 2, 2014. ^ a b c d Sheridan, Emily (July 17, 2012). "'I want to mix it up': Why DJ Alesso is the next big thing in dance music... and even Madonna has noticed". Daily Mail. Retrieved December 2, 2014. ^ a b c Ryan, Patrick (November 23, 2014). "On the Verge: Alesso saves the day with EDM 'Heroes'". USA Today. Retrieved December 2, 2014. ^ a b c d Gritt, Emma (November 20, 2014). "Alesso: 'I just bring good emotions to people'". The Independent. Archived from the original on February 18, 2015. Retrieved December 2, 2014. ^ a b "Exclusive Interview with Alesso". Beat My Day. May 9, 2010. Archived from the original on December 8, 2014. Retrieved December 2, 2014. ^ a b "Alesso discusses his year, 'Calling,' SHM, and more with us at Electric Zoo (Interview)". Dancing Astronaut. September 8, 2011. Retrieved December 2, 2014. ^ Gossett, Eric (November 7, 2014). "10 Things We Learned From Alesso's Reddit AMA". Less Than 3. Retrieved December 2, 2014. ^ "The Top 100 DJ's of 2011". Synthtopia. October 21, 2011. Retrieved December 3, 2014. ^ "Interview With Alesso". Dani Deahl. September 12, 2011. Retrieved December 3, 2014. ^ Martin, Paul (June 3, 2011). "[Electro] Pressure (Alesso Remix) – Alex Kenji, Starkillers, Nadia Ali". The Music Ninja. Retrieved December 2, 2014. ^ a b Barker, Chris (November 28, 2012). "Alesso explains the making of Years". MusicRadar. Retrieved December 2, 2014. ^ "Alesso". DJ Magazine. 2012. Retrieved December 3, 2014. ^ Alport, Jonathan (October 19, 2013). "DJ Mag Top 100 Revealed [Updated Live]". Your EDM. Retrieved December 3, 2014. ^ Hampp, Andrew (July 15, 2014). "Alesso Signs To Def Jam, Debuts 'Tear The Roof Up' Track". Billboard. Retrieved December 3, 2014. ^ Sawers, Paul (September 8, 2014). "Top DJ and producer Alesso turns to Snapchat to premiere his new music video". The Next Web. Retrieved December 3, 2014. ^ Ward, Nick (November 4, 2014). "Alesso Explains Lack Of 'Real Emotion' In EDM". Your EDM. Retrieved December 2, 2014. ^ Ward, Nick (October 29, 2014). "Alesso's Charity Event Breaks Record". Your EDM. Retrieved December 2, 2014. ^ "Alesso Delivers A Flip Of His Song "I Wanna Know" With Jolin Tsai". October 3, 2016. Retrieved March 31, 2018. ^ "Highlights at IMS Asia-Pacific". Music News Asia. Retrieved October 4, 2016. ^ AbhinavM (October 4, 2016). "Jolin Tsai – PLAY (Alesso Remix Version)". We Rave You. Retrieved March 31, 2018. ^ Penrose, Nerisha (October 10, 2016). "Alesso Recruits K-Pop Group EXO's Singer Chen For 'Years' Rework: Watch". Billboard. Retrieved October 18, 2016. ^ "[POP스포]엑소 첸XDJ 알레소, 10월 7일 콜라보 'Years' 발표(공식)". Retrieved October 4, 2016. ^ "엑소 첸, 스웨덴 유명 DJ 알레소와 콜라보…7일 음원 발표". October 4, 2016. Retrieved March 31, 2018. ^ "Hailee Steinfeld & Alesso's 'Let Me Go' With FLAGALine Is A Crossover Jam For The Ages — Listen". Retrieved September 8, 2017. ^ Medved, Matt (October 13, 2017). "Alesso & Anitta Team Up on Alluring New Single 'Is That For Me'". Billboard. Archived from the original on July 12, 2018. Retrieved August 31, 2018. ^ Erik (July 29, 2018). "Alesso Returns To Progressive House With An Unbelievable Tomorrowland 2018 Weekend 2 Set". EDM Sauce. Retrieved August 31, 2018. ^ "Tiesto, Alesso Added to Electric Zoo 2018 Lineup". Billboard. Retrieved May 4, 2018. ^ "Alesso debuts new single, 'Remedy,' on Good Morning America". Dancing Astronaut. September 6, 2018. Retrieved January 10, 2019. ^ "Alesso Performs for a Second Night in Los Angeles". Muse. October 6, 2018. Retrieved January 10, 2019. ^ "Twitch Megastar Ninja Launches Preorder For EDM Compilation Album 'Ninjawerks'". Tubefilter. November 30, 2018. Retrieved January 10, 2019. ^ Beach, Fontainebleau Miami. "J Balvin And Alesso Set To Ring In 2019 At The Legendary Fontainebleau Miami Beach". www.prnewswire.com. Retrieved January 10, 2019. ^ "Here's the lineup for this year's Snake Pit at the Indianapolis 500". FOX59. January 29, 2019. Retrieved January 29, 2019.